SHENZHEN, CHINA, 9 JUNE – Malaysia Healthcare, in partnership with Tai Orient International (Tai Orient), together with Shenzhen Yikang Maternity Hospital, held a press conference today, to announce a CSR programme supporting 18 Chinese couples to undergo fertility treatments in Malaysia. This initiative anchors upon Malaysia’s medical excellence in fertility, in line with the country’s positioning as the fertility hub of Asia, with the theme Giving Hope to Dreams. Malaysia Healthcare will be facilitating this campaign in China to increase the awareness of the Assisted Reproductive Treatment (ART) that Malaysia provides, offering aspiring parents the opportunity to attain the joy of parenthood. The second and third phases of this programme will be conducted in the cities of Chengdu and Shenzhen, sharing the details of ART throughout the region. Malaysian fertility centres are highly equipped with state-of-the-art technologies renowned within the medical field. Technologies such as Next Generation Sequencing (NGS), Time Lapse Embryoscope, Piezo-ICSI, and 3D Laparoscope complete a significant part of the ideal ecosystem for healthcare travellers. In addition to that, our embryologists are very experienced having received training from top medical institutions in Malaysia, UK, Australia, and the US. These digitally driven, high-quality fertility treatments are offered in Malaysia at affordable costs. Three of Malaysia Healthcare’s top fertility centres, Sunfert International Fertility Centre, Alpha Fertility Centre, Fertility Associates, and one of Malaysia’s leading private hospitals, Prince Court Medical Centre have shown their support for this programme to continue building awareness and demonstrating the quality of Malaysia’s fertility treatment offerings. Tai Orient will support the healthcare travellers’ accommodation, flights, and facilitation. As a premier, award-winning healthcare travel destination, Malaysia offers world-class quality treatments and services to aspiring parents. Equipped with cutting-edge medical technology and internationally trained healthcare professionals, Malaysian healthcare services can provide these couples with the best medical care in the country. Aside from establishing the country as the Asian Hub for Fertility, Malaysia is also positioned as the Asian Hub for Cardiology, with the theme ‘The Heartbeat of Asia’. Malaysia Healthcare has continuously raised its position as a global healthcare travel destination over the last few years. 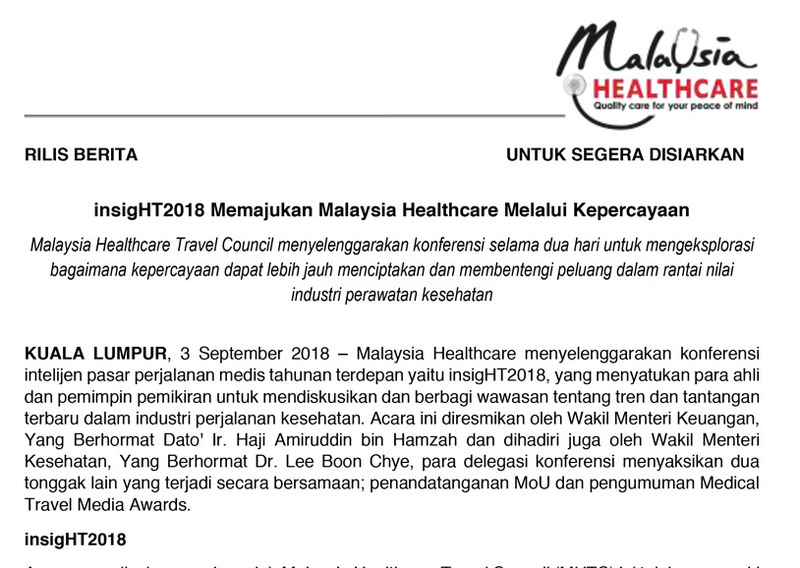 The country was named “Medical Travel Destination of the Year” at the International Medical Travel Journal (IMTJ) Medical Travel Awards 2015 – 2017, and recently, MHTC was recognised as the “Medical Travel Cluster of the Year” at the IMTJ Medical Travel Awards 2017-2018.Malaysia has also been acknowledged as the “Best Country in the World for Healthcare” by International Living’s Annual Global Retirement Index from 2015 to 2017.